You will have to stay up late to see the waning gibbous moon, the planet Saturn, and the star Spica tonight. Alternatively, you can wake up early tomorrow. Our chart shows the eastern sky for mid-northern North American latitudes somewhere around 10:30 to 11:30 p.m. tonight. The sky scene will look similar for mid-northern latitudes in Europe and Asia, except that the moon will be higher up above Saturn and Spica. 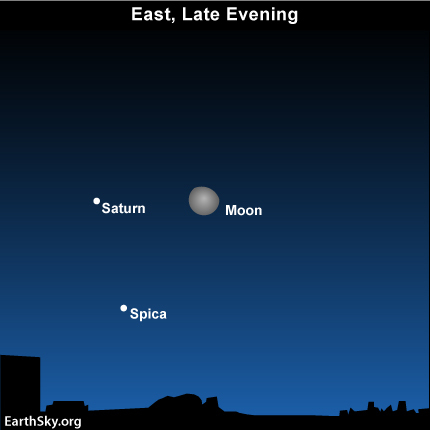 For most places worldwide, the moon rises first, followed by Saturn and then Spica. For the precise rising time of the moon, Saturn, and Spica into your sky, check the links on our almanac page. After they rise, the moon and Saturn travel westward across the sky during the night. They do this for the same reason that the sun moves from east to west during the day. It is because the Earth spins from west to east on its rotational axis. Therefore, the sun, moon, planets, and stars appear to wheel westward across our sky each day, but it is really the Earth that is doing the spinning. Now consider the Earth and Saturn in their orbits around the sun. 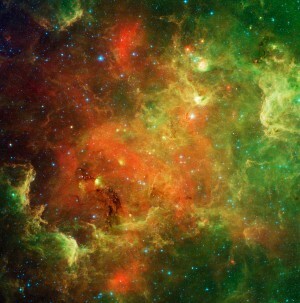 Day by day, the Earth – the 3rd planet from the sun – is gaining ground on Saturn, the 6th planet out. Earth’s orbit is smaller, and we move faster than Saturn does in orbit, so we come between Saturn and the sun nearly every year. Around midnight on April 4, 2011 (Universal Time) the Earth will pass between the sun and Saturn – and will come closest to the ringed planet for this year. At that time, Saturn will be opposite the sun in our sky. Thus, Saturn will shine all night long on the night of April 3/4, rising around sunset and setting around sunrise. Between now and then, Saturn will come into view earlier each evening. Watch for it! Site contents copyright © 2019 Recorder Online	except as noted. All rights reserved. | 88 queries in 2.499 seconds.